Storage Rewards is a loyalty program for our customers to earn points. Points can then be redeemed as a store credit to be used towards a future purchase. It's just another way for us to say thank you and how much we appreciate you as our customer. You are automatically signed up for a Storage Rewards account when you make any purchase at www.stampnstorage.com. If you haven't purchased a Stamp-n-Storage product or you purchased at an expo or pop-up sale, you can sign-up for Storage Rewards by clicking the Storage Rewards - Loyalty Program button at the bottom right of your desktop screen or bottom center of your mobile device. Complete the prompts to create your store account. Just create an account on our website to sign up. If you're a previous customer at Stamp-n-Storage, you've already registered! Every Purchase earns 5 points per dollar. More Points = Better Rewards! Share Stamp-n-Storage on Facbeook and Twitter to earn 250 points each for a total of 500 points. You can share Stamp-n-Storage once every month! You can also get 250 points for following us on Instagram. Refer: 500 Points for you, 10% off for your friends. You'll receive an exclusive link that you can share with your friends. They'll get 10% off their first purchase, and you'll receive 500 points after they make their purchase. Make sure they understand to click the link you share, this is the only way we know you sent your friends our way! Scroll down and copy your unique coupon code link. Your friends must click the link to receive 10% off. We want to celebrate your birthday! Just enter your birthday and you'll receive 1,000 points on your birthday. That's an instant $10 store credit! Note: Birthdays must be entered one month in advance of your birthday to receive points for the current year. Click the banner on the lower right corner of your screen to sign-in. Note: You'll have to select the banner again after signing in to access your points. Your account will be credited with the amount you redeemed and can be used with your next purchase during the checkout process. Points earned from a purchase are credited to your account when your order is shipped. 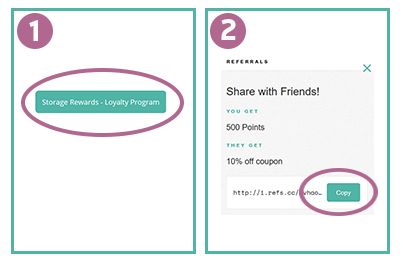 Points earned by registering and sharing are credited immediately. Discounts apply to product value only, tax and shipping are not discounted.